Why should I pre-register my child? Good question! 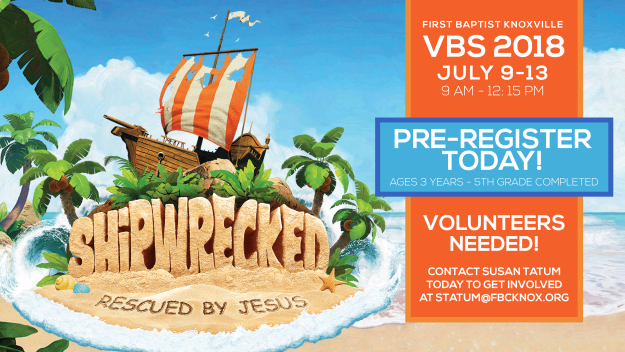 If you have attended our VBS in the past and know you'd like to attend this year, pre-registering your child is the best way to ensure a smooth check-in process. You will already be in our system, so we'll already have your child's nametag made and class assigned. This way, we'll be able to register new children more quickly and get started with the festivities sooner! While July seems like a lifetime away, we are already preparing by gathering volunteers for this huge outreach event! Sign up with Susan Tatum ( ) to serve as a small group leader or assistant, or serve on one of our teams: recreation, drama, craft, registration, or hospitality. Once you’ve signed up, plan to attend one of our volunteer training dates on June 3 or 10. You only have to attend one of the trainings.